The double loop style of wire binding provides a highly effective and affordable binding option for a wide range of document types. 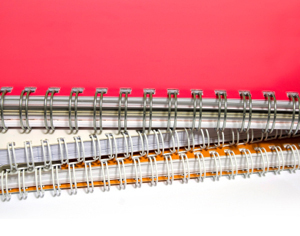 From 2:1 pitch for larger sized documents to 3:1 pitch for smaller sized documents, and even Spiral-O wire, our binding experts will select the best wire binding method for your job. Contact us today for a free consultation and estimate on your binding needs. 8:30 am - 5:00 pm Mon. - Fri. Locations & Hours • Copyright © 2019 Advanced Marketing Partners, Inc.